There is quite a lot of SwimRun equipment that you will need to need to think about. Some of the gear you will have already, but other things you will need to get. As always, when it comes to performance and value for money, you tend to get what you pay for, but there are ways of making things simple, and also saving money! As beginners ourselves, we have been through the process, and are still learning! We have done 3 SwimRun events so far. The first was in Croatia, (the first time Ötillö have held an event there), the second was the Ötillö event at Engadin in Switzerland, and finally we took part in the Bologna SwimRun at lake Brassimone and Suviana in Italy in summer 2017. Now we are training for the 38km SwimRun race at the Isles of Scilly, UK, again organised by Ötillö, to be held on Sunday June 9th 2019. Here are the things we have learned so far on our journey regarding SwimRun equipment! 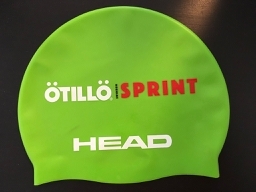 In almost all races you will be given a swim hat, which you MUST wear during the swim legs of the event. This is a compulsory piece of swimrun equipment. Of course, you may take your swim hat off during the running sections if you want to - when you start to get too hot! The hats are usually provided by the race organisers, and are intended to make you more visible to the race marshals around the course who are monitoring the competitors. The hats at these events are emblazoned with the logo of the event and sponsors names - something to collect! To read all about your race day swimrun hat please go to SwimRun Hat. For general training, especially in open water, we advise using a brightly colored swim hat. We prefer the silicone hats - they're more durable, softer and more comfortable than latex hats. 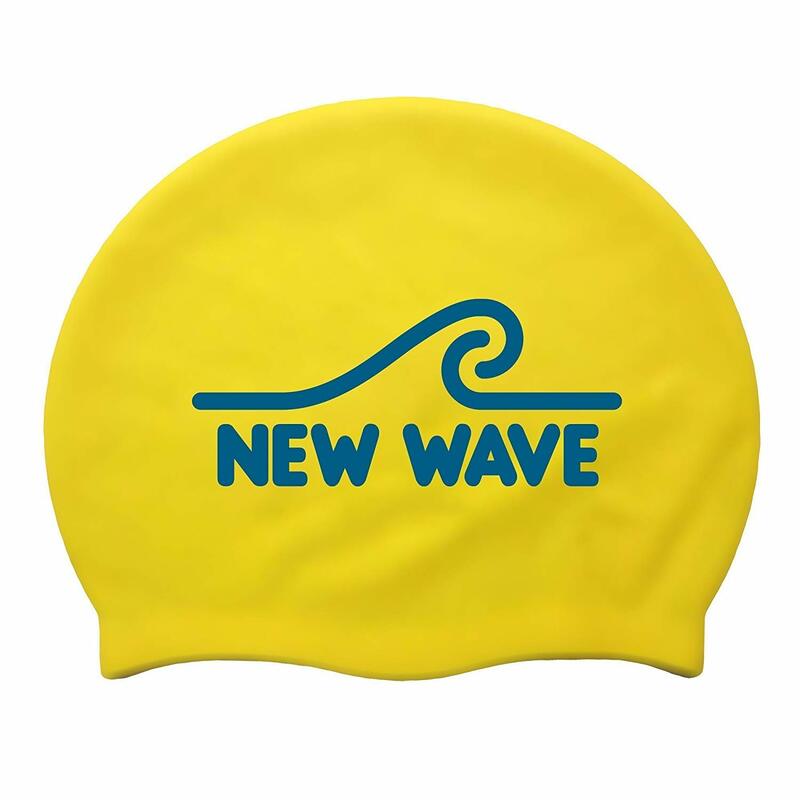 There's a great choice on Amazon - here's a link to one of our favorites the New Wave Swim Cap which comes in a variety of fluorescent colors. You'll certainly be spotted in one of these! Goggles are a very personal choice, but again, essential swimrun equipment! 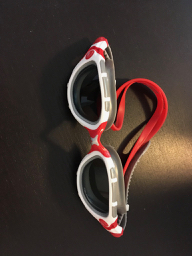 SwimRun goggles usually work better when they are more of an "open water" design, as opposed to normal indoor pool training goggles. This is because you are going to be wearing your SwimRun goggles for several hours, depending on the length of the events you enter. You MUST have goggles that are comfortable for long periods of time, work well in salt water as well as fresh water, AND allow good vision. The qualities to look for are explained in my special page, SwimRun Goggles. Wetsuit - an important piece of SwimRun Equipment! 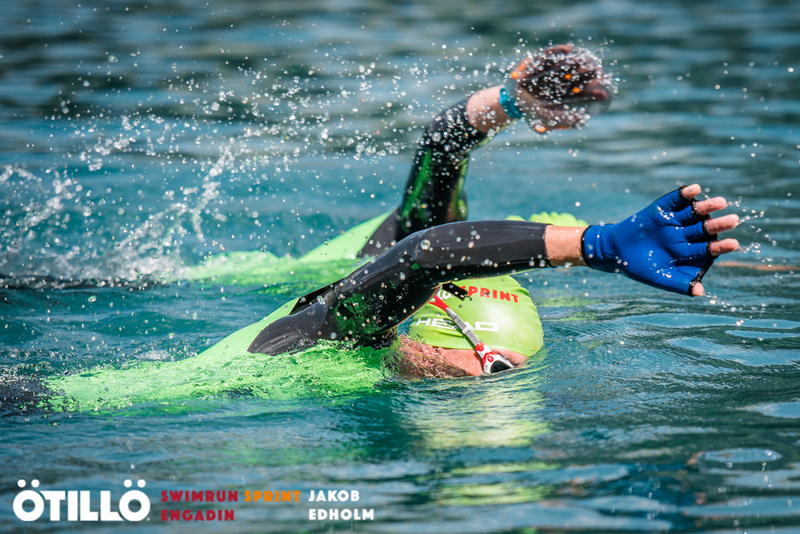 Wetsuits are compulsory for most Ötillö SwimRun events, as they are usually held in cooler european waters, typically the ocean around Sweden, Norway, Russia, and the high mountain lakes in Switzerland. I’m sure there are many other swimrun events around the world where wetsuits are not required, and one I know of for sure is the Bologna event at the end of July; triathlon competition suits are required! So, what sort of suit do you need? There are three basic options, based on how seriously you want to take this new sport, and your budget! Take a look at swimrun-wetsuits for the FULL story! Socks are super-important in SwimRun. Remember, you are going to be running in wet trail shoes, so your feet will tend to slide around a little more than when running in dry shoes. And the skin of your feet will be wet, and therefore softer. Added together, the risk of rubbing and blisters is quite high. A good-quality sock will go a long way to reducing that risk. One of the best (and the socks we wear) is made by Swedish firm Gococo. They claim to use a revolutionary yarn and knitting method that allows the socks to dry really quickly, and is also smooth on the skin, reducing friction and blister risk. I don’t know about all the science, but I can tell you that we are both really happy with our Gococo socks! We use the long socks which also have calf compression for SwimRun events, and the short socks for other running events such as marathons. Because you are going to be swimming in your shoes, you will need shoes that can tolerate repeated soaking and drying. Some buoyancy in the shoes will help to keep your legs from sinking while swimming. And because you will be running on potentially rough and stony tracks, you will need shoes that can protect your feet from sharp edges, while providing good grip on slippery and uneven surfaces. Sounds like quite a tall order! Standard trail shoes are a good place to start looking. They already have many of the features that we want in a good SwimRun shoe - AND THEN WE CUSTOMIZE the trail shoes to make them BETTER for SwimRun. FIND OUT HOW WE DO THIS at SwimRun Shoes! Our favorite shoes for SwimRun are from Swedish company Salming. A tow rope is something unique to SwimRun! Remember, SwimRun is a TEAM sport - you compete in teams of two, whether it be two men, two women, or a mixed team. And the two team members have to remain within 10 metres of each other AT ALL TIMES during all swim and all running legs. 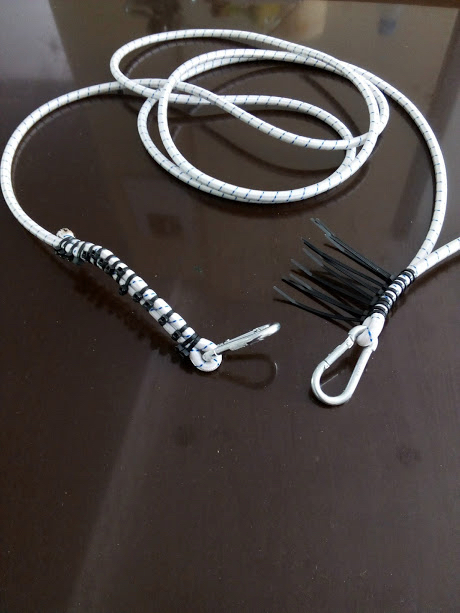 To find out how to make your own, custom-size tow rope (also called a SwimRun Pull Cord), go to the special page at SwimRun Tow Rope. 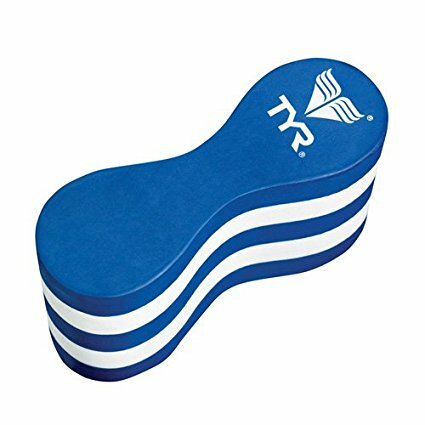 Why do most swim runners use some sort of a float for the swim sections? I’m not talking about the bright orange safety floats that open-water swimmers frequently use for visibility and safety - I’m talking about the sort of training float also known as a “pull buoy”. Originally, the idea was to put the float between your legs during training sessions in the pool, to practice “arms - only” swimming, keeping your legs still. The float helped to stop your legs from sinking. Your arms got a good work-out. This idea has been “borrowed”by the inventive swim runners! There are TWO factors that make using a float attractive, and ONE negative factor that initially put us off using them. FIND OUT MORE by going to the SWIMRUN FLOAT page! Having done a few races and training for our big event we decided to invest in a Pull Belt Kit that included 2 belts, 2 Pullbuoys and 2 tow ropes. We got this Kit from Swimrunshop.com and chose the support kit. The Pull Belt Support is designed with a simple side release buckle for the pull buoy and d-rings front and back for a snaphook support cord. This makes it possible and easy to take off the elastic cord at technical and difficult off-trail runs, and do the transitions very fast. The pull belt support is available in 2 sizes, and can be purchased as a team kit including: 2 belts, 2 pull buoys ready for pull belt and an 1 neon orange support cord and 1 neon pink DIY 5m bungee cord. 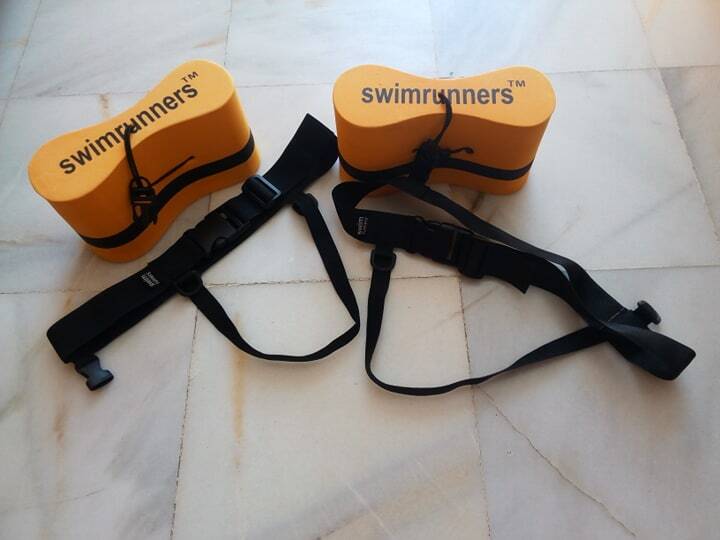 We're loving the new Pull Belt Kit as the pull buoy clips in easily so doesn't fall down your leg when running as our original pull buoys did and it's comfy and easy to clip the tow rope on quickly. Well worth buying! Swim Run Equipment rules allow competitors to use hand paddles. Again, this used to be a training aid for pool swimming, to help strengthen arm muscles used in swimming by increasing the resistance experienced by the arms. I have been using webbed neoprene gloves, as they are easier to carry on the run, and I can vary the resistance during swimming by opening or closing my fingers. On some SwimRun sites, webbed neoprene gloves are frowned upon, and they say they will inhibit your swimming and also your running. I DISAGREE. As a beginner, I find the webbed neoprene gloves to be a great compromise! Easy to swim with, and super-easy to run with! READ MORE about SwimRun Paddles and my efforts to switch from neoprene gloves to paddles HERE!